(A) Venn diagram representing the distribution of the down-regulated transcripts in the datasets, where 113 transcripts were mutually down-regulated in all datasets (i.e., down-regulated core genes). (B) Venn diagram representing the distribution of the up-regulated transcripts in datasets, where 199 transcripts were mutually up-regulated in all datasets (i.e., up-regulated core genes). (C) The clustering of the proteins encoded by the down-regulated core genes of cervical cancer according to their molecular activities. 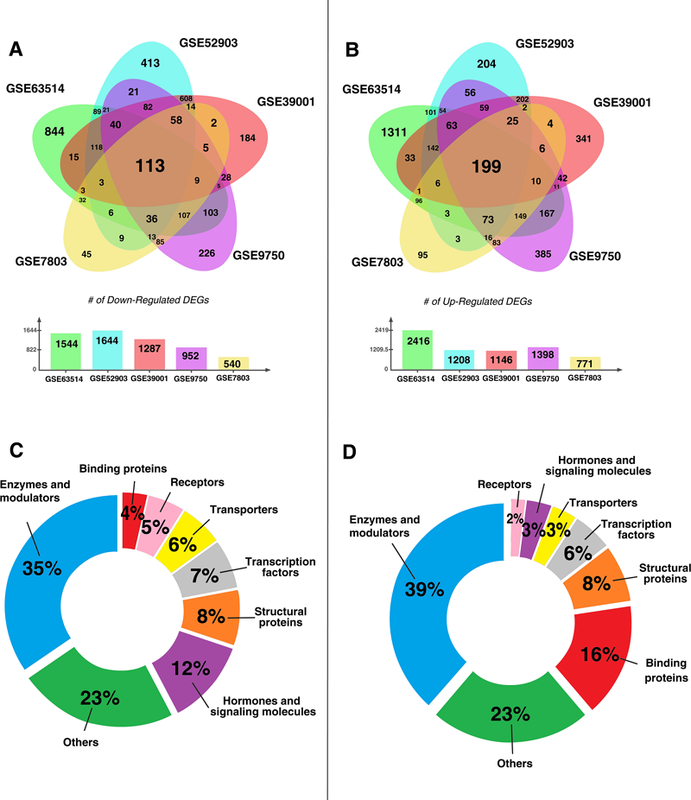 (D) The clustering of the proteins encoded by the up-regulated core genes of cervical cancer according to their molecular activities (DEGs: differentially expressed genes).The gene set overrepresentation analysis of the core genes based on the annotations stored in KEGG and GAD databases resulted in (particularly cancers), p53 signaling, and pyrimidine metabolism . Periodontitis, hypospadias, and arterial blood pressure pathways were down-regulated, whereas up-regulated core genes were enriched in those associated with the cell cycle, DNA replication, oocyte meiosis, several cancers (colorectal, bladder, breast, ovarian, lung, stomach, and prostate), autoimmune disorders (including rheumatoid arthritis and systemic lupus erythematosus), Alzheimer’s disease, p53 signaling pathway, and pyrimidine metabolism.